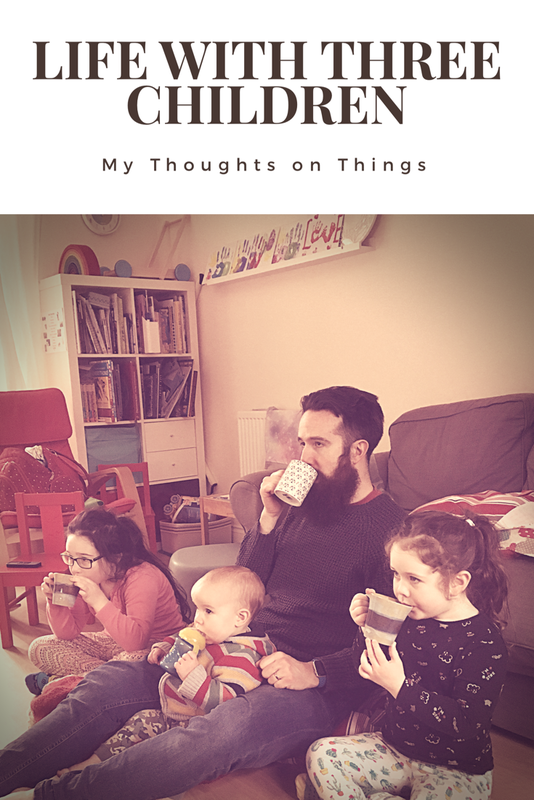 My musings, thoughts, ideas and opinions on God, life, parenting and the books I read. I have started and stopped writing this countless times, because the whole idea of sharing has made me anxious and panicky. I began to worry about how this post would be received. I don’t want to be in receipt of a sudden surge of guilt induced sympathy and offers of help. I don’t want people to think I’m incapable of looking after my children. Or a danger to them. I don’t want people to blame my feelings upon our parenting choices, and brush off my worries as unimportant. There is still stigma around mental health issues. Loneliness is belittled as laziness. There are plenty of people out there to be friends with - what’s the problem? In America, those against gun control use the argument that its people with mental health issues who are the problem. Today the Duchess of Cambridge gave birth to her third child. She and Prince William have been initiated into the exclusive club of parents with more than two children! It’s a fun club, if loud and exhausting. I read the news that Catherine had gone into labour as A was taking his morning nap, lying in my arms, curled around my bump, and I was drawn to thinking about what life has been like over the last 18 months of being parents of three children. Obviously, we don’t have the hordes of support around us that Catherine and William do, but I suspect there will be some similarities ahead. The day we brought A home. When that third little person popped out, their parents were officially outnumbered. When it’s grown ups vs. kids, the kids get the deciding vote. You chase that one; I’ll chase this one; but the other one gets away. Another adult will always come in handy. I struggle to get out and about with three, because I only have 2 hands. I have to trust that B will stay close. I doubt the Duke and Duchess of Cambridge will ever be short of extra adults to assist them, but I’m sure they’ll feel the strain of never having enough hands. Following on from being outnumbered, there is the struggle of how to deal with there always being one child who feels left out. Mummy/Daddy only has two knees to sit on, two hands to hold, two sides to sit next to, and inevitably every child wants to be on one of them. You become the masters of convincing little people that sitting opposite you is a much better option. 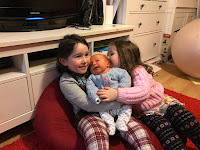 You learn to make deals with them, promising a longer cuddle later or the chance to choose the next activity or tv programme in exchange for swapping with a sibling. It’s difficult. Disclaimer: This book was gifted to me, free of charge, by Sarah Ockwell-Smith, to be reviewed. However, this review is my unbiased and honest opinion of the book. Price: R.R.P. £13.99, but currently available for £9.72 at The Book Depository. Blurb: Sarah Ockwell-Smith, founder of BabyCalm and ToddlerCalm, is passionate about ‘gentle’ parenting. Her mission is to let parents know that there are other ways to cope with a toddler apart from putting him or her on the naughty step or resorting to controlled crying. This book will fill a gap in the market, helping parents enjoy their toddlers, understand the limitations of current popular toddler parenting methods such as sticker charts and time out, and to have the confidence to ignore the current mainstream ‘experts’ and parent their own child with trust and empathy. Chapters include: Why toddlers are not mini-adults; the importance of night-time parenting; coping with a picky eater; communication – toddler style; avoiding difficult situations; the importance of unconditional love and why you don’t need to be permissive to parent respectfully. When I pick up a parenting book (and actually have time to read! ), I have to be careful to open my mind. I tend to go into them thinking that I'm either going to disagree with everything, or that I'll just be told what I already know. I read a few books before B was born, but they were mainly theoretical ones or about breastfeeding. I like to think that I have instinctively parented B as a baby, but the toddler years have sort of crept up on me and I have struggled at times. B is strong-willed - which I am pleased about, but this can be hard work too. 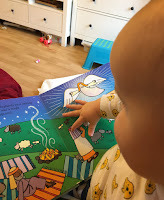 I have a copy of Sarah Ockwell-Smith's BabyCalm, which I never got around to reading, but I have read a lot of what she puts on her blog and found that I agreed with much of it. So, when I got the opportunity to get a copy of ToddlerCalm to review, I jumped at the chance, figuring that it would either give me lots of tips to try or that it would just confirm that what I'm doing already is fine. Well, I can tell you that I was pleasantly surprised by ToddlerCalm. I didn't find it patronising or prescriptive. It was an easy read and very supportive of our parenting style. What I liked the most was the scientific slant. There are three chapters that deal specifically with science: Why toddlers are not mini adults; The science of toddler sleep; and The science of picky eating. I tend to parent in a way that feels right to me, trusting my mother's instincts and my gut. If I wouldn't want to be treated in a particular way, then I try not to treat B in that way. So to read a great deal of scientific fact that backs up my instinct and existing knowledge is very encouraging and helpful. It also comes in handy when responding to the questions and criticisms of those who don't understand or approve of our parenting style. To have the words of a psychologist reinforcing my instincts adds weight to my choices. To have the information about brain development to explain why my toddler behaves in a certain way is a brilliant reminder to me to be more patient and understanding, and is useful in explaining to others why we are dealing with her behaviours in a way that they may disagree with. Instincts and nature can be easy to dismiss; science is much harder to argue with. I found ToddlerCalm to be very supportive of the attachment parenting style, though I am aware that Sarah Ockwell-Smith doesn't approve of the AP label. (Check out this excellent blog post on the topic.) 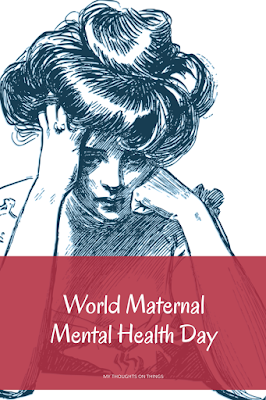 In fact, the reason for this is because Attachment Parenting as a movement grew out of the attachment theory, which Ockwell-Smith advocates, having studied it as part of psychology. The book is also supportive of parental choice. She doesn't like to be referred to as a parenting expert, as she maintains that parents are the experts on their own children, and should be able to trust their own instincts and parent children as individuals. The book encourages parents to think for themselves, and to choose a gentle, positive parenting style. It is very helpful in that it gives the words and explanations that help in clarifying our own ideas and in explaining to others why we've chosen to parent that way. The book isn't prescriptive. There is none of the strict routine and expectations that most mainstream parenting guides advocate. ToddlerCalm provides lots of real life stories and examples of parenting style, whilst Ockwell-Smith's CRUCIAL™ method allows space for our own parenting to come in. The success of this lies in having individual plans for individual families and individual children. There is no specific way of parenting your toddler, short of being gentle and understanding; rather, the book will empower parents to know that they can parent in the way that is right for their family, instead of feeling that they must do what friends/relatives have done, or failing to keep to a specific schedule or routine. I love how honest Sarah is throughout the book. She writes frankly of mistakes she made with her own children and of how she could have done better. And that's where this books goes another step above and beyond other parenting books. She's a mum!! She's not some childless, self-proclaimed expert who believes they know the best way for children to be brought up. She's not writing from a hypothetical standpoint. We can learn from her mistakes - real things, not what she thinks children ought to do. I found ToddlerCalm to be very much about changing and taking charge of our own behaviour as adults, in order to model and guide to our children. We are the grown up, mature ones - they have lots to learn. We can't expect them to be perfect members of society yet. ToddlerCalm is a parenting book that I would definitely recommend. I need to go and read BabyCalm now!! 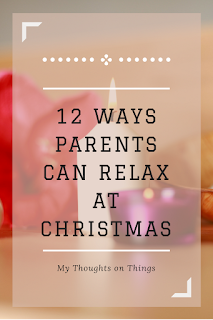 Hello and thank you for hopping over from The Newby Tribe and welcome to the 12th day of #12DaysOfParenting. Today's sponsor is Gitte Winter Graugaard who is offering a copy of The Children’s Meditations In my Heart and the theme is Parenting Highlights of the Year and 2018 Wishes. My keyword to enter today’s giveaway is in this post below, good luck! Full details of the #12DaysOfParenting terms and conditions can be found on the #12DaysOfParenting page and all entries are to be completed via the Rafflecopter at the bottom of this post. 2017 has been a creative year. B has blossomed in her drama group, showing herself to be a funny and talented little actress. Her grasp of accents is impressive, and her comic timing is wonderful. She has also progressed in Jiu jitsu and will be moving up from the Tots to the Juniors class in the new year. If you haven’t seen her for a while, she’ll be somewhere curled up, reading. She reminds me of myself. A total bookworm. She’s worked her way through the Roald Dahl collection several times, and often finishes a book and goes straight back to the start to read it again. I think she’s read Matilda eleven or twelve times now. Enid Blyton is a new arrival to her reading pile, as she recently discovered the Magic Faraway Tree and Wishing Chair books. She’s also a Shakespeare fan, thank goodness, and has made her way through the Andrew Matthews and Tony Ross Shakespeare stories. M is my wild child. She’s stubborn and hilarious and sharp and clever. She knows her own mind and there’s no chance of changing it for her. She’s become quite the little Street Dancer. Street Dance suits her because she’s sassy and confident. She and A are thick as thieves - he laughs at everything she does. Her drawing is coming along beautifully. I love to see her creations; they are sure to make me smile. She is learning to read, though her ability to memorise a book very quickly makes it tricky to know whether she’s reading the words or just reciting them. I know it will eventually come together though, and she’ll do it all in her own time. We Jiu jitsu is coming along nicely too. I like to watch her and B sparring and practicing their breakfalls together. We’ve watched A grow into a funny little boy, who is on the verge of walking full time, though he much prefers to crawl and climb. He still has very little hair and is working on his 9th and 10th teeth. He adores his sisters and they make him laugh. He signs ‘dog,’ ‘duck,’ ‘chicken,’ ‘milk,’ ‘finished,’ ‘hurt,’ ‘baby,’ and ‘friend.’ He loves to blow kisses and say, “Hiya!” when he sees someone he loves, or “Hello!” if he hears a phone ring. Still no “Mama” though “Dad-Dad,” “Gamma,” and “Ganda” are frequently heard. Especially “Ganda,” as no one else gets a look in when Granddad is around. A loves Granddad to the point that he will throw himself to the floor dramatically when he gets up to leave. B’s first drama performance, a small play of Aladdin, in April. B’s history quiz and M’s Spanish quiz, written for Nannie’s birthday party in May. M’s first Dance performance in June. A learning to climb the stairs in July. A trip to the story museum, and B’s Lego Birthday party in August. Our first Camping holiday in September. A’s 1st Birthday, and finding out we’re expecting number 4 in October. M’s Monster Party, and the arrival of our nephews in November. B’s Christmas Drama Performance, M’s Christmas Dance Show, snow, and number 4’s first scan in December. Looking ahead to 2018, I’m wishing for an easy and relatively unstressful pregnancy, especially after the negatives of the last one. We’re looking to relocate, so I’m hoping that will be as easy as it can be, and that we’ll find a great Home Ed community to be a part of. I’m looking forward to seeing the children bloom and flourish, to see more of their creativity, and to hearing A begin to talk. I’m wishing for more patience and energy and socialisation for myself too. And we wish you all a very merry and peaceful Christmas and a New Year full of every joy. If you would like to read another post and gain another entry, then head over to Me and B Make Tea for their take on Parenting highlights of the year and 2018 wishes. Check out My Thoughts on Things on Facebook. Hello and thank you for hopping over from The Newby Tribe and welcome to the 11th day of #12DaysOfParenting. Today's sponsor is Plyt who are offering a Plyt Board Game and the theme is 12 Ways Parents Can Relax This Season. My keyword to enter today’s giveaway is in this post below, good luck! Full details of the #12DaysOfParenting terms and conditions can be found on the #12DaysOfParenting page and all entries are to be completed via the Rafflecopter at the bottom of this post. Parenting is can be stressful. Christmas is stressful. Put the two together and it's a recipe for a full on grown up meltdown. I'm not very good at relaxing. There is always something to do, and if I stop, it's probably because I've fallen asleep. So it's not really hypocritical of me to try to tell you how to relax - I'm talking to myself as well! I asked my best friends and the Hubby to help me with this post. I'm in too deep to see the way out of this stress hole my children have dug me into. The perspective my friends gave me was sorely needed. Hello and thank you for hopping over from Me and B Make Tea and welcome to the 8th day of #12DaysOfParenting. Today's sponsor is Learning Resources who are offering an 8 pack set of playfoam and the theme is Blogger's Choice. My keyword to enter today’s giveaway is in this post below, good luck! Full details of the #12DaysOfParenting terms and conditions can be found on the #12DaysOfParenting page and all entries are to be completed via the Rafflecopter at the bottom of this post. I mentioned the other day that we have a Christmas bookshelf, and we add books every year. I'm often on the lookout for new and interesting Christmas books, so I thought a few suggestions from us might help others. I fully intended to separate our favourite Christmas books into age groups, but when I asked the girls which of our Christmas books they like the most, they picked the same three each! This is a brilliant book. 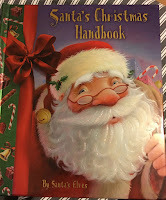 Santa's Elves have written this guide to ensure Santa knows what to do in any situation. With plenty of flaps to peek under on every page; facts and tips for children to remember; and even Santa's Insta-Chimney, it's a book that keeps everyone entertained for ages. B is 6 and M is 4, and they both find plenty to look at in here. B is happy to read it aloud to her sister, and there are so many great illustrations, that M can spend plenty of time perusing it by herself. 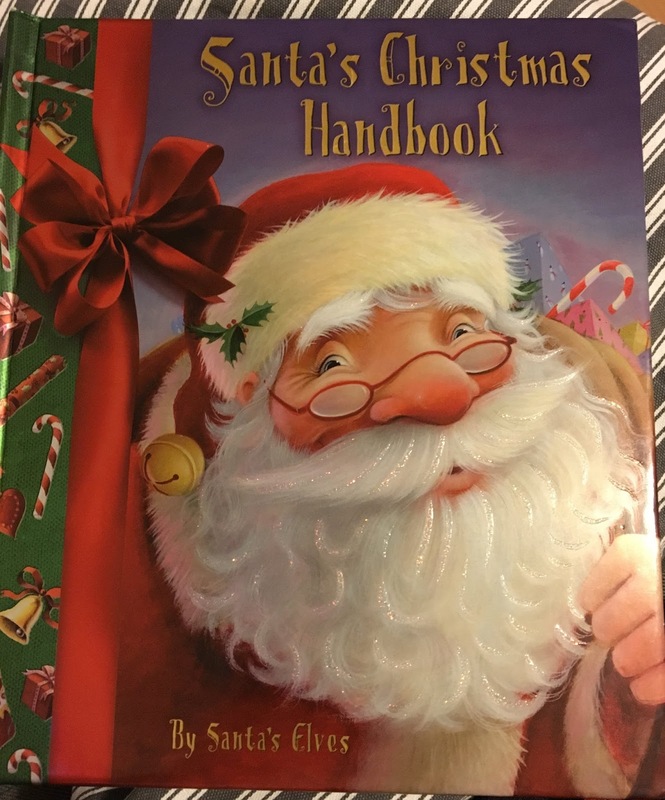 Santa's Christmas Handbook is the sort of book that doesn't need to be read from cover to cover, and I'm pretty sure that I've still not seen every page. Definitely worth getting for the laughs and the magic. There's even a board game to play at the end! We've read this book for the first time this year and already it has become much loved. Angela - of Angela's Ashes, but when she was a child - is concerned that the Baby Jesus in the church's crib scene will get cold at night, and so she comes up with a plan to take him home and keep him warm. It's a beautiful story about a little girl's reverence for the Holy Child, and I love her determination to do what she believes is right, regardless of what might happen to her. 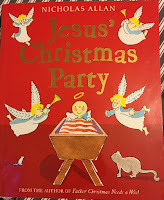 There is humour here too, especially both B and M's favourite part - when the Baby Jesus flies through the air! Loren Long's illustrations are soft and add to the innocence of the tale. I was so glad that the girls picked Angela and the Baby Jesus as one of their favourites, because it's one of mine too. I would suggest this is for a confident reader, but easily enjoyed by younger children when read aloud. 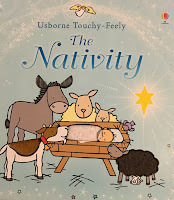 This Usborne Touchy-Feely board book was the first Christmas book we bought for B. It has stood the test of time, and is still enjoyed six years later. A really enjoys this book. As with all Usborne Touchy-Feely books, there are plenty of different textures to explore on each page - even on the front cover. A particularly likes all the fluffy sheep, and M likes to point out the hiding mouse in every picture. 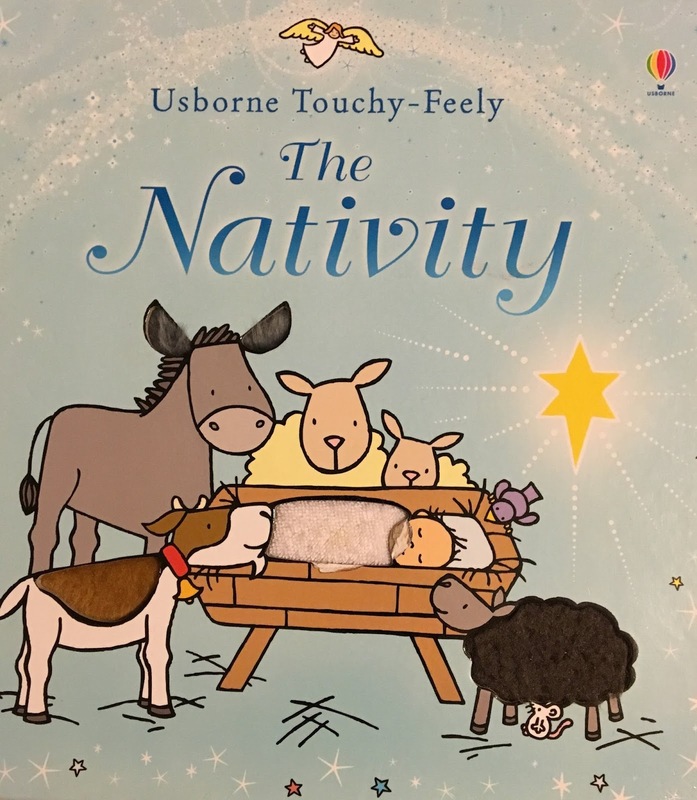 The story of the Nativity is told very simply, from Mary and Joseph's journey to Bethlehem through to the arrival of the Wise Men. Simple language means it's good for younger readers - and the sentences are short enough that you can read them out before impatient toddlers turn the pages. A firm favourite with the whole family. Even A, who's almost 14 months, enjoys Jesus' Christmas Party. It's funny and sweet, and has a refrain that is easily remembered and shouted out by those being read to. The use of simple language means it's great for younger readers, and the illustrations are fun, adding to the humour in the story. I don't want to ruin the story - though you can probably guess it! - so all you need to know is that it's about an Innkeeper who really enjoys sleeping, and doesn't deal so well with his disturbed night. 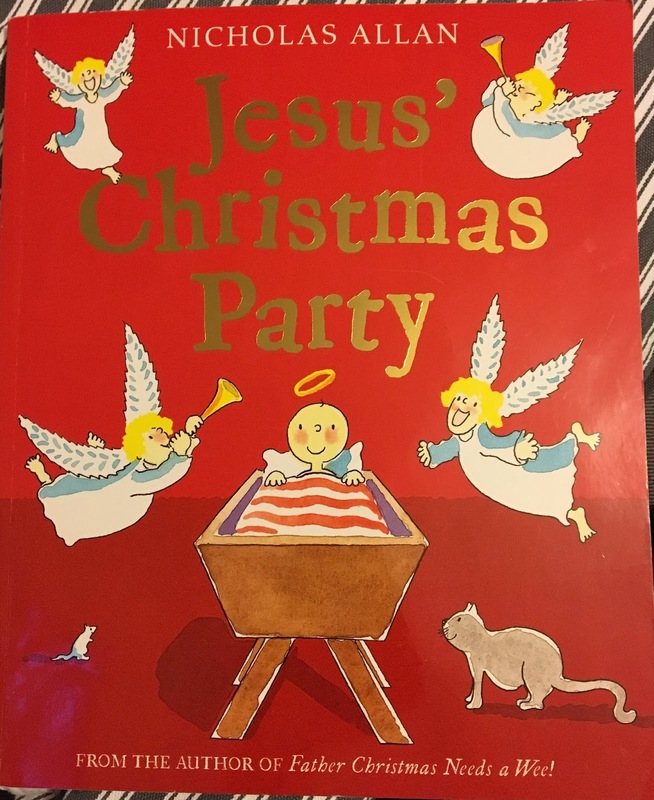 If you only ever buy one Christmas book, this should be it. Does your family have a favourite Christmas book? If you would like to read another post and gain another entry, then head over to Welsh Mum of One for their own choice of topic. Hello and thank you for hopping over from Bumps Babies Tots and Teens Mummy Diaries and welcome to the 7th day of #12DaysOfParenting. Today's sponsor is Bertie Blue Crafts who are offering a magnetic photo frame for a door and the theme is Mini Gifts Made Simple. My keyword to enter today’s giveaway is in this post below, good luck! Full details of the #12DaysOfParenting terms and conditions can be found on the #12DaysOfParenting page and all entries are to be completed via the Rafflecopter at the bottom of this post. 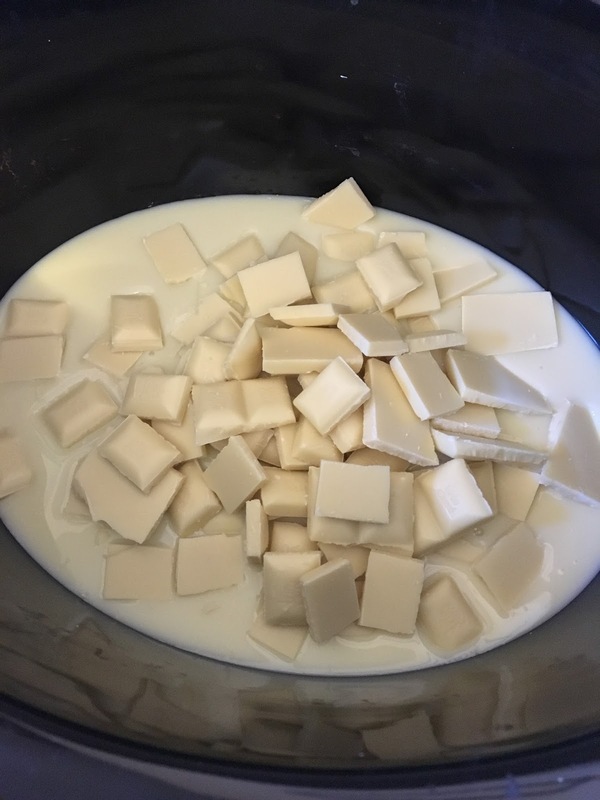 This year the children and I have been making fudge to give as mini gifts to friends and family, and also to have on hand in case of visitors with unexpected presents! It's hugely simple - I can't even remember where I found the basic recipe, but it's used a lot on this Fudge group on Facebook. We use the basic recipe and then mix it up a bit with different additions and flavours. 2 x cans Condensed Milk - I buy mine from Lidl, because it's cheaper and not made by Nestlé! Hello and thank you for hopping over from BumpsBabies Tots and Teens Mummy Diaries and welcome to the 6th day of #12DaysOfParenting. Today's sponsor is Science4You who are offering a Sweet Factory and the theme is Family Traditions Sorted. My keyword to enter today’s giveaway is in this post below, good luck! Full details of the #12DaysOfParenting terms and conditions can be found on the #12DaysOfParenting page and all entries are to be completed via the Rafflecopter at the bottom of this post. I love how steeped it is in history and tradition. How we do the same things each year; the same things that have been done for decades, centuries. We sing songs that our grandparents sang, and their grandparents before them. Foods are flavoured with the same spices our ancestors used at Christmas. At church we speak the same words and say the same prayers that have been said for generations. And I love how you can look through the windows of all the houses on your street and see a Christmas tree, lit with fairy lights and topped with an angel or a star. Christmas is a time when we have so much in common. So what a shock it is to discover that other people also have different traditions to us. We marry into families who have vastly different Christmas days to us and it can be overwhelmingly surprising. For some it becomes a real sticking point. Hello and thank you for hopping over from Bumps Babies Tots and Teens Mummy Diaries and welcome to the 4th day of #12DaysOfParenting. Today's sponsor is Bags of Love who are offering a Personalised Apron and the theme is Your Christmas Dinner De-Stressed! My keyword to enter today’s giveaway is in this post below, good luck! Full details of the #12DaysOfParenting terms and conditions can be found on the #12DaysOfParenting page and all entries are to be completed via the Rafflecopter at the bottom of this post. This year we are having our first Christmas at home with no extended family. I am so excited to be fully in charge this year! I’ve made Christmas Dinner many times, but this will be the first year that I am responsible for cooking whilst only having one other adult around to supervise children. So I’ve been getting organised. 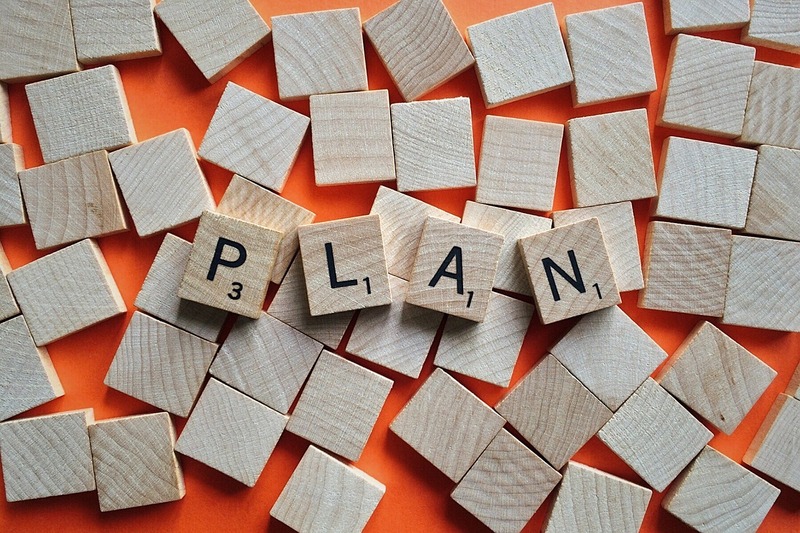 My biggest tip is to make a cooking plan, with all the timings for everything written down. This has saved me many a time. One day I’ll save it somewhere or print and laminate, but today is not that day! Scribbled down in pencil on a piece of paper will have to suffice. Hello and thank you for hopping over from The Butterfly Mother and welcome to the 3rd day of #12DaysOfParenting. Today's sponsor is It’s a Sling Thing who are offering an Ergobaby Original Carrier and the theme is Activities to Keep the Family Occupied! My keyword to enter today’s giveaway is in this post below, good luck! Full details of the #12DaysOfParenting terms and conditions can be found on the #12DaysOfParenting page and all entries are to be completed via the Rafflecopter at the bottom of this post. Even in the years when I’ve been super organised at Christmas, there have still been plenty of last minute things to do. Jobs that are just easier without children underfoot. So a few activities here and there to keep the family out of my way and out of trouble have come in very useful. 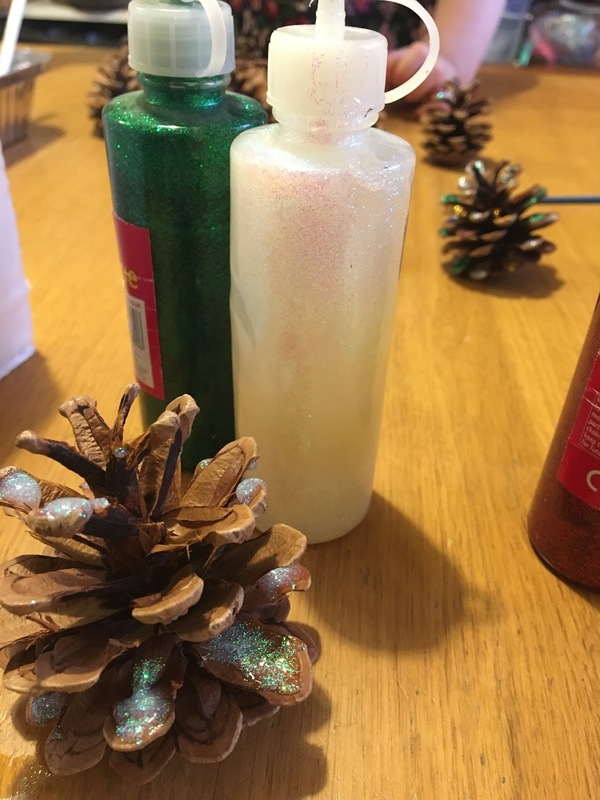 A pile of pine cones and some glitter glue make an easy craft that needs very little supervision. And with a piece ribbon attached to the top you have some lovely decorations to send to grandparents! 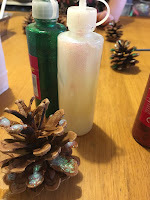 In the past I have found a few cheap Christmas craft sets at Hobbycraft, Wilkinson’s, etc. These provide a good half an hour - usually - of space for me to potter and get things done. Even when requiring some help or supervision, I find I can do small tasks at the same time. Why I'll be voting for Seana Talbot for NCT President.